European settlement of the Mundrabilla area began with Tom and John Kennedy, and a married couple named Bill and Annie McGill. In 1872 the Kennedy brothers and McGills trekked 1200 ardouous kilometres to the east of Esperance in the hope of selecting grazing land at Eucla. Chronic water shortages, difficult terrain and 1500 exhausted sheep forced them to abandon their journey however. The Kennedys and McGills later settled at Mundrabilla homestead where they found good grazing lands and sufficient water for their stock. Tragically Tom Kennedy was later speared to death, and Annie McGill died during childbirth in 1879. During the 1920s engineers from the Indian Pacific Railway also hoped to discover significant underground water supplies in the Mundrabilla area. Drilling teams were a common sight throughout the Nullarbor at the time, and numerous boreholes were sunk in the hope of discovering water to power early 20th century locomotive boilers. At Mundrabilla the mother of all boreholes was sunk to a depth of 472 metres. At that depth the drilling team were dismayed to discover that they had reached a bedrock of solid granite - and more to the point, there was absolutely no water whatsoever. Despite receiving a miserly 6 inches of rain per year Mundrabilla continues to rely on pastoral activities for its existence. To the south of Mundrabilla lies the Great Australian Bight where a small Rock Lobster industry has developed. 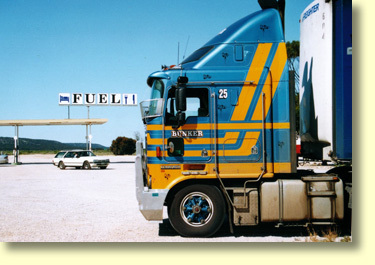 For semi trailer drivers and other Nullarbor travellers Mundrabilla is a welcome rest and refueling stop. Mundrabilla Roadhouse is operated by Bruce and Joanne Mulroy. Normal Roadhouse opening hours are from 5-30 AM to 12PM seven days a week. Mundrabilla's Roadhouse staff can also provide home cooked meals aswell as the usual takeaway fast foods. Mundrabilla Bar is also attached to the Roadhouse and is open from 11AM to 12 PM seven days a week. Mundrabilla Bar is definitely one of the Nullarbor's snuggest little bars and comes complete with a pool table and interesting collection of pubobilia. One of the quirks of Mundrabilla Roadhouse is that Bruce permits his pets to wander about the place. 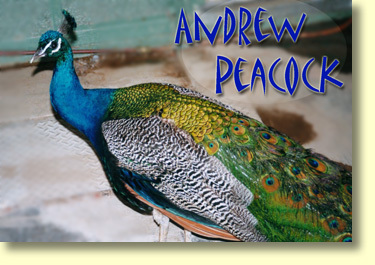 Whilst there, Nullarbor Net met the very colourful "Andrew Peacock." Travellers should note that over the years Mundrabilla Roadhouse has developed a reputation for having some of the cheapest fuel on the Nullarbor. 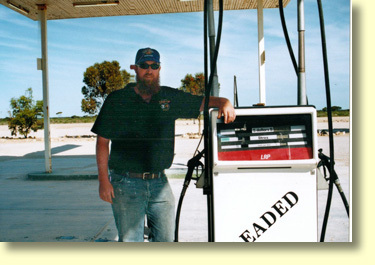 Mundrabilla Roadhouse is one of the few locations that sells Super Grade petrol on the Nullarbor and down the track Bruce and Joanne also plan to install an LPG fuel facility. For the most upto date petrol prices from Mundrabilla Roadhouse telephone (08) 9039 3465, or email mundrabilla@bigpond.com. Bruce will only be too happy to oblige. Mundrabilla Roadhouse has 10 En suite Motel Units fitted out with televisions and fridges. Current tariffs range from $85-00 and up per night for 2 or more people. Within the Roadhouse travelers will also find 20 powered caravan sites at the going rate of $20-00 and up per night for 2 or more people. Campsites are also available at a nightly rate of $15-00 and up for 2 or more people.Please note these prices are valid as at November 2007. Mundrabilla Roadhouse also accepts Mastercard and BP Card. For further information and bookings telephone Bruce or Joanne on (08) 9039 3465. Alternatively email Mundrabilla@bigpond.com. Mundrabilla is very much a rest and refueling stop for Nullarbor Travellers. The area does however have some attractions for those travellers prepared to depart the beaten track. Twenty kilometres to the south lies the Great Australian Bight. Access to the Bight is made by the Wanteen Beach Road and this is where the locals go sand beach fishing. Apparently Whiting and Herring are commonly caught species in this area. Fresh Lobster or Crayfish can also be bought from the Rock Lobster Receival Depot. Located 20 kilometres to the west of Mundrabilla are numerous small caves and sinkholes. These features are located along the "Old Coach Road" which lies atop the Hampton Tablelands. Should you wish to access these areas Nullarbor Net recommends you ask for directions and discuss your plans with Bruce at the Roadhouse. Mundrabilla Roadhouse is one of the few places on the Nullarbor that sells Super Grade petrol. Elsewhere travelers will be required to buy Premium fuels and fuel additives. By Nullarbor standards fuel prices at Mundrabilla represent excellent value for your driving dollar. If you are travelling between Adelaide and Perth, fuel prices for petrol, diesel and LPG can be viewed at ExplorOz's Western Australian and South Australian fuel website pages. Another regularly updated and particularly good website is Fuel Watch. Fuel Watch provides pricing coverage for the Perth metropolitan area and country areas within Western Australia. A final thought. Please read the sign regarding dogs and urgent calls of nature! The sign says "You have just passed 1,000's of acres to the left and 1,000's to the right. So PLEASE let your dogs out somewhere else".